Cinematico is an open-source application, which will allow you to build up your own video-sharing website in no time. The use of the script is easy and it provides a number of essential features for the development of such websites. It will also require no development knowledge for the configuration of your website. 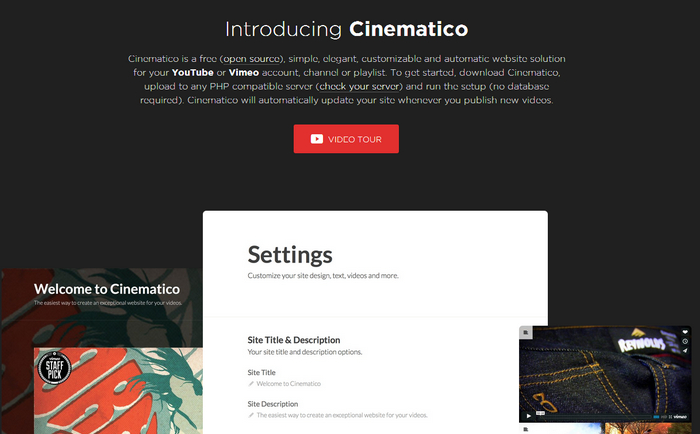 With the use of Cinematico, you can simply link your user, channel or a plalist at YouTube and Vimeo and the script will automatically import all of the available videos on your website. Cinematico will structure and display them in a beautiful manner so they can be easily reviewed by your users. Cinematico does not require the use of a database as it does not keep much information on the server. It is simply linking your videos, hosted directly on your YouTube or Vimeo accounts, which will save space and resources for your website. To help you get started with Cinematico our Technical Support team provides Free Cinematico Installation.